Anyone in the market for massive sprawling estate right on the coast in Malibu? 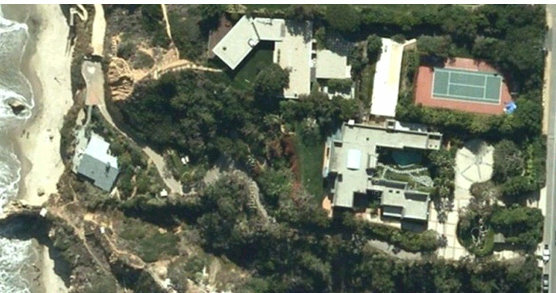 Better yet, what about the fact that Brad Pitt is the owner of this Malibu beach house? That’s right folks, this can all be yours for a cool $13.75 million, and my guess is that the price is negotiable since Brad Pitt bought the estate for only $8.4 million back in 2005 just after splitting up with former wife Jennifer Aniston. The list price and availability is confirmed on Realtor.com where you can also view more pics of the Brad Pitts beach house. Situated stunningly between the Pacific Ocean and the Point Mugu State Park, the gated mid-century modern home features four bedrooms and four bathrooms and 4,088 square feet of space — plus a modern stainless kitchen with top-line appliances, bamboo flooring, walls of glass overlooking the ocean, a private cove on the beach, three fireplaces, a tennis court and a state-of-the-art security system. Are you ready to write up a contract? If so, maybe you can remember where you first heard of the new listing and slip me a little bit of a kick back… what’cha think? 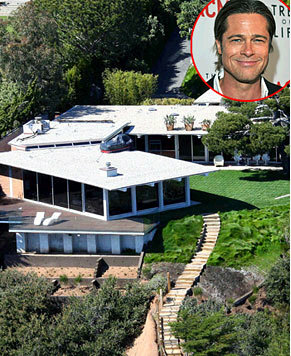 Why is Brad Pitt selling his beach house? I can’t say for sure why Brad Pitt is looking to sell his Malibu beach house other than he wants to put the Jennifer Aniston years behind him completely. Of the other reason could be that him and his wife Angelina Jolie have their own home, a newly renovated estate in Chateau Miraval in Correns, France. Or who knows, maybe he just has a real estate agent who talked him into listing the home and Brad Pitt could really care less one way or another. My guess is this scenario is probably more realistic.